From Stormtroopers to sushi, these are the instadram accounts to make your news feed next level. By Matt Evans. From the sweeping Highland surroundings of Scotch whisky’s distilleries to the liquid’s golden colour, whisky is an inherently good-looking spirit by default. Small wonder, then, the rise of Instagram has generated a vibrant community of whisky photographers, reviewers and personalities. Where does the newcomer to Instagram’s whisky tribe jump in? What separates one bottle photographer from another? 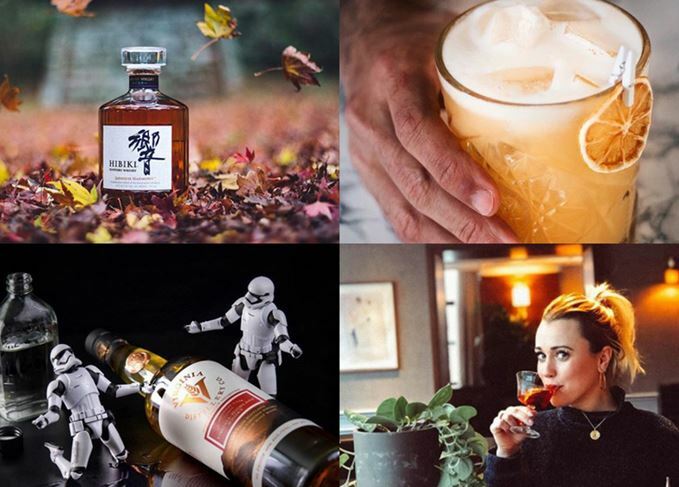 Presented here are 10 of Instagram’s best whisky accounts from across the world, with both big names and undiscovered gems getting an equal share in the spotlight. Like, regram, follow. With one account holder based in Chicago and another based in LA, the Axis of Whisky spans the entire United States. A popular account with over 46,000 followers, the Axis bring everything from Pennywise the clown from IT sipping Scotch on Halloween, to hints for getting the most bang for your buck when it comes to whisky purchases in the States. Want a slice of whisky life from all across the land of the free? You need the Axis in your feed. Follow for: Sumptuous sushi pics alongside wine and whisky recommendations. Based in both Toronto and Hong Kong, the account owner known only as Vincent specialises in Asian food such as sushi and exquisite-looking ramen bowls. Wine, beer and coffee are all present, but play second fiddle to Vincent’s whisky recommendations. Perfect for the renaissance whisky fan, a drinker who is curious and experimental by nature, as well as foodies looking for Asian-fusion inspiration. The Instagram account of whisky travel blogger Noortje, the candid distillery shots paired with tasting notes for individual bottles make this feed a highlight reel for whisky tourism, a great way to add distilleries to your bucket list and grab recommendations for bottles to pick up while you’re there. Let @WhiskyLifestyle guide you on your next great adventure. Stormtrooper action figures and bottle photography collide with this unique account. Innovative still-life photos depict the Scotch Trooper’s (aka Brett’s) action figure collection getting into Toy Story-esque mischief by sampling their owner’s whisky collection. Bottles are reviewed and tastings are recounted, meaning fans coming for the whimsy can stay for the content. It’s no wonder Stormtroopers famously can’t shoot straight. As the Instagram juggernaut has grown, some great amateur photographers have stepped up to share their bottle shots over the years. Whisky Nation collects the best of the community’s photography, creating a hub of gold-tinted, candid shots celebrating the best this list has to offer. In the process, the Nation has created a following among ‘instadram’ enthusiasts, sporting over 60,000 followers. Created by Bacardi ambassador Georgie Bell and Scotchwhisky.com editor Becky Paskin, OurWhisky challenges global misconceptions of who enjoys whisky by presenting a stark reflection of the modern day whisky drinker. In an effort to demonstrate whisky is not just a ‘man’s drink’, the account invites men and women across the world to use the #OurWhisky hashtag when posting pics of themselves and their friends enjoying a dram. Challenging prejudices and transforming the way the industry looks at whisky drinkers, OurWhisky is a movement gathering steam. Follow, submit your own photo, and #jointhemovement. Fede, otherwise known on Insta as @welcometomybar, is a global marketer for Diageo by day, and a mixologist on a mission by night. Although his whisky cocktails range from the classic Old Fashioned to more outlandish creations such as Matcha Highballs, he also works with a full range of spirits to broaden your home-bar horizons, notably his outstanding-looking Tiki creations. If you’re going to learn to mix a few drinks, you may as well learn from the best. Linh Do, an artist and dressmaker from Southern California, uses whisky as a muse for her creative endeavours. Posting her designs both on this account and @whisky_anorach_designs, Do takes the essence of a brand and pours it into artwork, whether sketching distilleries or seaming her latest creation. The only whisky brand on the list, Suntory have taken the concept of terroir – whisky becoming infused with a sense of the place where it was made – and, in true Spinal Tap fashion, ramped it up to 11. Peer around the bottle shots to see the best Japan has to offer, whether cherry blossoms in spring or snow-capped mountain peaks. Sublime. Why follow: Bottles and drams with backgrounds of sumptuous landscapes. From wind-whipped precipices to serene lakeside coves, Whisky with a View is an account based on two principles: great-looking bottles and drams in the foreground, with incredible scenery as a backdrop. A few vertigo-inducing behind-the-scenes videos highlight the lengths some people go for the perfect regrammable shot, making this account a must-follow for hikers and daredevils with a penchant for a good dram. Why, in today’s gender-inclusive world, is whisky still perceived as ‘a man’s drink’?